RBI Grade B Officers Prelims Call Letter 2018: Reserve Bank of India (RBI) has scheduled the Grade B phase 1 examination in the month of August. A huge number of aspirants have applied for the RBI Grade B posts this year. All the hopefuls applied for the RBI Grade B posts will have to appear for the RBI Grade B Phase I (Online) examination on 16th August. Before going to appear for the Grade B examination candidates have to download the admit card. Visit the RBI Official website, rbi.org.in to download the admit card. Candidates have to download the admit card and carry any of the valid identity proof copy such as aadhar card/voter id/driving license or any others along with the admit card. Candidate’s identity verification will be done at the examination center. Aspirants who fail to show the hall ticket will not allow attending the examination. So, candidates have to download and carry RBI Grade B Hall ticket while going to the examination. Reserve Bank of India (RBI) has released the notification for Grade B posts in recent times. The RBI posts include Officers in Grade ‘B’(DR)- General-127, Officers in Grade ‘B’(DR)- DEPR – 22, Officers in Grade ‘B’(DR)- DSIM -17 posts. Many of the aspirants have applied for RRB Grade B posts during the application dates. Since RBI is the largest organization, many of the competitors have competed for RRB Grade B posts this year. The RBI is going to scrutinize the suitable candidates through the written test (Phase 1 Online), Phase 2 offline test, and interview rounds. As part of the selection process, the RBI has scheduled the phase 1 online examination on 16th August. Candidates who are going to attend the phase 1 examination have to download RBI Grade B Admit card 2018 from the official portal, rbi.org.in. Candidates applied for the RBI Grade B posts can download the RBI Grade B admit card before 10 days of the examination (tentatively). The RBI will release the admit card/hall ticket on its official portal, rbi.org.in. 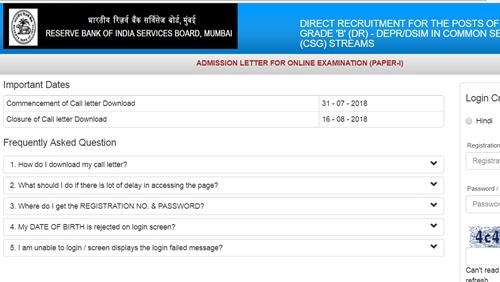 after downloading the admit card, check the details of the examination venue, date, and timings from it. Also, the RBI is going to print the candidate’s basic information such as name, register number, date of birth, photograph, signature and other details on it. Hence candidates can go through the information once after downloading it. How to download RBI Grade B Phase 1 Admit Card 2018 Online? Search for RBI Grade B admit card link on the homepage. The details will be asked such as register number, password etc. The RBI Grade B Call Letter 2018 gets downloaded. Go through it to check the details of the examination center, and other details. Take a printout and preserve it safe to take it to the examination on.